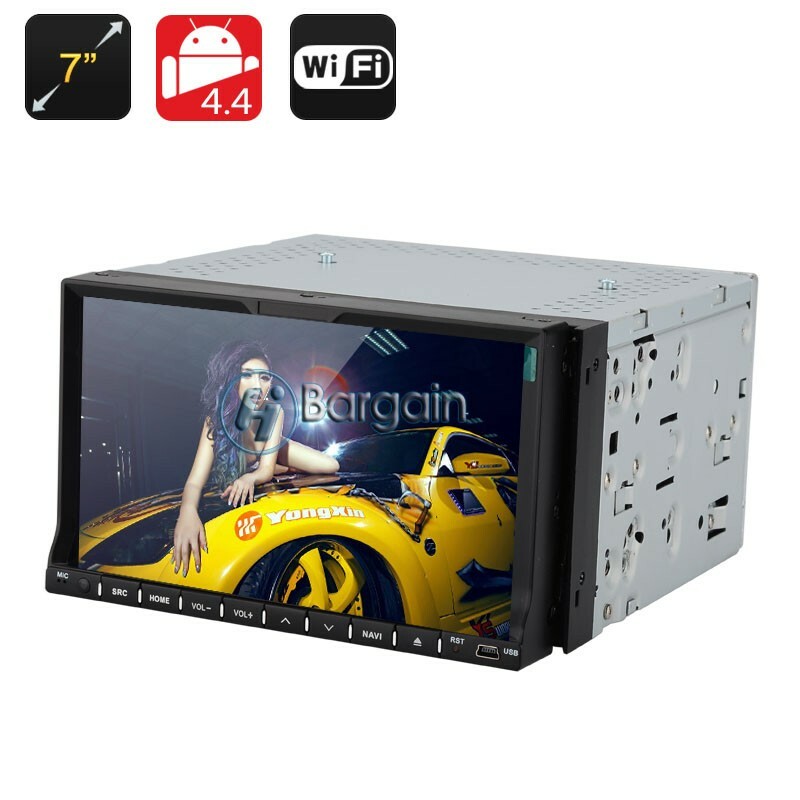 2 DIN 7 Inch Car DVD Player - 7 Inch Touch Screen, Dual Core CPU, 1GB RAM, Android 4.4, GPS , 3G, Wi-Fi, RDS Control, Bluetooth,Universal fitting 2 DIN Car DVD Player with slide out 7 inch screen, GPS Navigation, 3G, Wi-Fi, RDS control and Bluetooth. Universal fitting 2 DIN Car DVD Player with slide out 7 inch screen, GPS Navigation, 3G, Wi-Fi, RDS control and Bluetooth. The perfect upgrade for your motor, this 7 inch retractable screen in car entertainment system has a universal fitting for use with most vehicles and plays all popular discs as it is classed as region zero, also known as region free. It also supports most digital media file types so you can enjoy all your favorite music, movies wherever the open road takes you. This 2DIN head Unit features a SIRF III, 20 Channel GPS receiver and supports Android maps so with its powerful antenna you can be guided to any designation via voice directions. Support for a Wi-Fi dongle provides the option to get fast 3G data connection on this car entertainment system so you can surf the web, download apps and even play games from the Google Play store, which comes preinstalled. It's easy to store and load GPS maps directly through a dedicated micro SD card slot and with a second card slot available for all your personal data, games and files there's plenty of storage space to keep loads of music films and games without impeding your ability to store maps. For hands free communication on the go take advantage of this DVD player's Bluetooth capabilities and sync up your Smartphone. This will let you make and receive calls as well as share your music without hassle. A dedicated lead for ipods as well as a micro USB port lets you connect your portable device directly. With RDS control you can use the buttons on your steering wheel making this easier and safer to use as you won't have to take your eyes off the road. This product is in stock now, we offer a 12 months warranty on all our products. Brought to you by the leader in electronic devices as well as wholesale gadgets, Chinavasion.